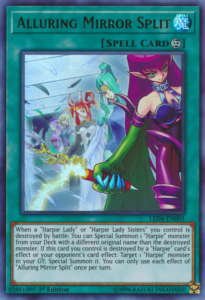 When a “Harpie Lady” or “Harpie Lady Sisters” you control is destroyed by battle: You can Special Summon 1 “Harpie” monster from your Deck with a different original name than the destroyed monster. If this card you control is destroyed by a “Harpie” card’s effect or your opponent’s card effect: Target 1 “Harpie” monster in your GY; Special Summon it. You can only use each effect of “Alluring Mirror Split” once per turn. Alluring Mirror Split is another card like Oracle that will allow you to search out cards you need in the archetype. Continuous Spell that thins your deck and Special Summons a Harpie monster with a different name off battle destruction of another Harpie Lady. You can’t get another of the same monster, but with so many “Harpie Lady” monsters, you shouldn’t have any issue, and it will allow you to get to your combo starters. If Mirror Split gets destroyed it will Monster Reborn a Harpie of your choice. You can destroy Split with your own Harpie effect(s) and get the Special Summon, eliminating the problem of Hunting Ground auto activating whenever a Harpie summons itself on your field and you have no other targets on your opponents field. It thins the deck and Special Summons, which is great. You can get to whichever Harpie you need in whatever situation you come across. Only problem with that part of the effect is: destroyed by battle. If it was destroyed by effect as well it would lend a lot more to its strength. The second effect does this and guarantees you’ll at least get something from this card. Perfumer and Oracle will give you a plus immediately, while cards like Dancer, Harpist, and Channeler will get you something as long as it’s your turn. Harpies ATK have always been low and this card gives you something for those low attack monsters defending you. Alluring Mirror Split is an interesting Continuous Spell Card with no cost. If a Harpie Lady or Sisters is destroyed by battle, you get to Special Summon a different Harpie monster from your deck. Might be fun to crash a sister to summon the brother or pet dragon. The second effect is if Alluring Mirror Split is destroyed by an opponent’s card effect or your own Harpie card effect, you get to Special Summon a targeted Harpie monster from the grave. Each effect is once per turn so you’d probably only run 2 since it is searchable. Putting monsters on the field is good and this has two ways of doing it. However, battle destruction is unreliable and can easily be played around. This also does nothing for you turn one. Support is better than no support, and at least it looks good. Next up in the line of Harpie support is one of the newest Spells in the archetype, Alluring Mirror Split. Alluring Mirror Split is a Continuous Spell that while you control it and a Harpie Lady or Harpie Lady Sisters is destroyed in battle, you can Special Summon a Harpie monster from your deck with a different original name than the destroyed monster. Floating is something the Harpie monsters lacked, so having a searchable way to turn your Harpie monsters into floaters is nice. Once again, every Harpie monster on the field except the Pet Dragons should be treated as Harpie Lady on the field if it isn’t already Harpie Lady Sisters. Also, if Alluring Mirror Split is destroyed by an opponent’s card effect or a Harpie card’s effect, you can target 1 Harpie monster in your GY and Special Summon it. A card that turns your monsters into floaters and replaces itself upon destruction is great, especially with that Harpie line because there will be times when playing the deck where you control Harpies’ Hunting Ground and your opponent doesn’t have any Spells or Traps, so destroying this is better than destroying your own Hunting Ground since the effect of Hunting Ground is mandatory. It’ll likely be you destroying this as well unless you don’t already have a Harpie monster in your GY. Both effects of Alluring Mirror Split are hard once per turns so you don’t float into too many Harpie monsters. I’d say this card is worth running in the deck since it can replace your Harpie monsters upon their destruction in battle as well as replace itself when it is destroyed. Two might be fine since it is searchable. Art: 4.25/5 You know all those Harpie Ladies got censored from the OCG to the TCG. So, Alluring Mirror Split (interesting name) looking at this card, I wondered if it had a Mirror Force type effect (it doesn’t) just given the name, but I digress. This is a Continuous Magic card, theme specific, that, similar to yesterday, has two separate effects. Each effect can only be used once per turn, as is standard legal text and clause in Yugioh. If your opponent is destroying your Monster, even if you’re replacing it, odds are, that unless that was the only Monster they had on the Field at the time, bringing out another Monster is likely only fodder to be destroyed that same turn. It could be used protectively, I grant you that, and I do feel that there’s advantage potentially to be had here. Just not enough, and not consistently. Lastly, you’ll see that if this card is destroyed by a Harpie’s card effect or by your opponent’s card effect (note Harpie’s Hunting Ground could/can destroy this) you can Target a Harpie in your Graveyard and Special Summon it. A Special Summon when you lose a card is good, and it’s just as good to see that from the Graveyard. Like yesterday, I see this is good enough, but not GOOD enough. Art: 3/5 Lots of color, the electro whip in the hand of the first Harpie is cool. I see plenty of glass, but I’m not really getting/seeing any Mirrors, let alone any splits…shouldn’t there be reflections or broken glass, something?